I appreciate the time you’ve taken to visit this site and find out more about Collegeville Dental Center, my team, and the many dental care services we can provide to help you achieve optimum oral health. Dr. Volkova is a 2000 graduate of University of Pennsylvania. She ensures that her patients receive the most comprehensive and advanced dental care by attending continuing education classes frequently and keeping up to date with current dental technology. 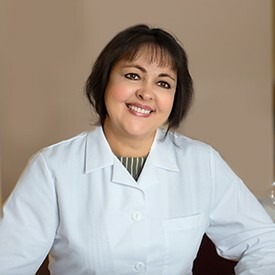 Dr. Volkova understands that for some patients, achieving dental health is a long and hard road, but she is more than happy to guide them through it. She is fluent in Russian and her hobbies include reading, cooking and traveling.